This is probably the oldest film I've ever seen but it didn't feel like it. It seemed pretty fresh and in an odd way - even contemporary. 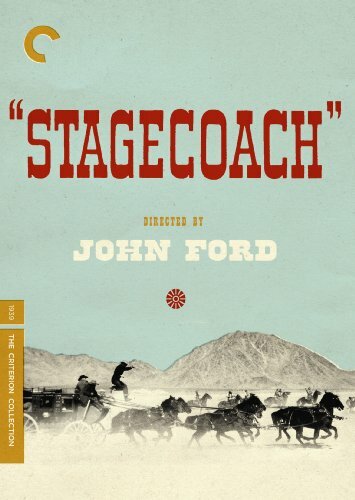 Before John Ford made quintessential great Westerns like The Searchers and The man who shot Liberty Valance he made Stagecoach which many consider as one of the finest Westerns ever made. It also happens to be the first big film for John Wayne and launched his career as one of the top box office draws of his time. It is a deceptively simple story - a horese-ridden coach making its way through Tinto to Kansas City - much like a railway line - through potentially dangerous Apache territory hounded by the fearsome Geronimo! However, the real story is the cluastrophobia of the coach and the often tense relationship of the nine people locked in it. In a way it may be the precursor to Lumet's great 12 Angry Men. It creates the same sort of tension between the characters. There is lively dialogue and political viewpoints that seem picked from today's blogs or newspapers rather than written 75 yeas ago. John Wayne as the Ringo Kid is fun to watch and so is Thomas Mitchell as Doc Boone who went on to win the supporting actor Oscar for a brilliantly played role of an alcoholic doctor with a heart of gold and wits to match. However, Claire Trevor was the biggest star at the time. She does a good job but her real brilliance really shows 5-years later in the amazingly dark and jarring noir Murder, My Sweet - which is easily one of my favorite old films. There have been a couple of remakes of Stagecoach but I am not sure anything would quite bring the raw grit of this version. Great use of 96-minutes of one's time.